I went to a restaurant I tend to go with my parents called Cuisine et Confidences. It is always packed during the weekly lunch hour. 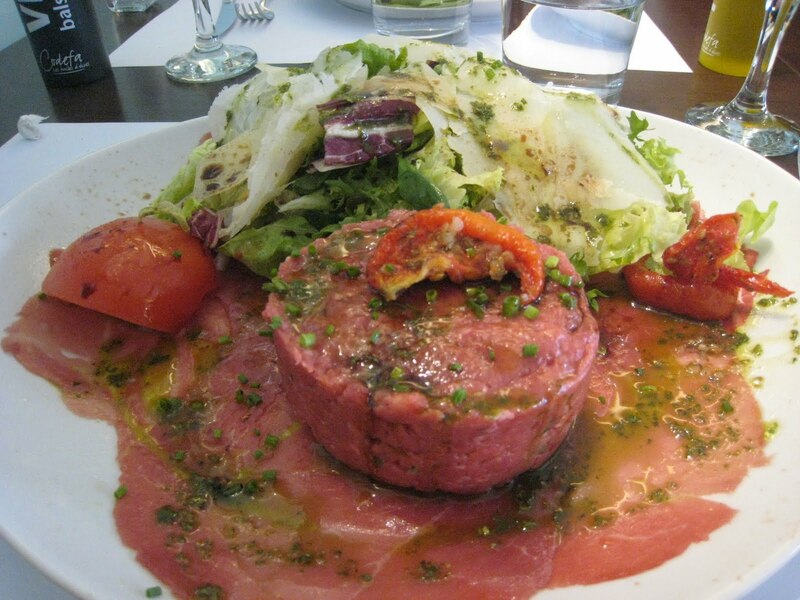 They have, by far the best steak tartare and carpaccio (yes in one dish!) served with olive and red pepper tapenades (this dish cost 14 Euros and it’s worth it since the Carpaccio costs 12 Euros and the Steak Tartare alone costs 13 Euros…so why not have the best of both?). The fun part about this restaurant is that you can literally ‘spray’ olive oil and balsamic vinegar onto your dish. But sometimes this task can be tedious as, for some people like myself, i like a lot of both and you continuously have to spray out the olive oil and vinegar from the bottle, where only a teeny bit comes out at a time.